1. Could you explain in more technical terms on the potential "loss of traction" situation you mentioned after Finding #17? I can't imagine the cause of such situation from my very limited knowledge about control theory. Thanks! 2. Do you think it is feasible to attach a test chart on the hot shoe and shoot toward a mirror, and recover the motion between the sensor and the camera body? The "loss of traction" means a situation where the feedback force exceeds the strength of the motor (i.e., due to limitations of the magnetic field forces) and where subsequently, the controller may try to (over)compensate for a longer period of time than necessary. As the earth's gravitation field is a constant force, it will then make a difference if the controller tries to move the sensor with or against gravitation. No. Because the shutter will actually not shift the body but rotate it around its center of gravity. So, the dominant rotation effect would mask any secondary relative shift effect. Last but not least. A relative motion between body and sensor is ok. It may minimize or magnify the blur effect of the moving body. So, we would need to measure the details of that motion. Did you test the degree to which the effect changes when shooting in portrait orientation; that is, the shutter moves left to right, instead of top to bottom as in the more commonly used landscape orientation? Can You suggest Pentax to remove the SR system as a possible issue to blur? Or, simply do You beleive sensor SR can make things worse? first may I ask all anonymous posters a favour? To leave a name even if it is an avatar name. To put things straight: there may be a problem in the way how the floating sensor in the K-7 reacts to high body accelerations. But this is NOT a fundamental problem of that kind of design. A certain "soft coupling" between sensor and body is even favourable as it helps to prevent blur from sudden body accelerations. It is the particular implementation in the K-7 which could be better. I imagine it is just some nasty overlooked detail. The K20D which has almost the same SR apparatus is much better in this respect. By a factor not explained by simply assuming a more lightweight shutter. So yes, I do still advice the K-7 to photographers where there is match. The two weaker spots are still hispeed action (take a Canon 7D) or low light (take a K-x). The mild shutter blur is nothing to really worry about. @Don: what can I add? Of course, SR mechanism complicates the situation. Having played with fire when we were supposed to run away (ages ago) has complicated the situation a lot! Thank You that You provided a solution for better photographs with our gear. All the best for You guys. A sloppy, unstable, weak, ill behaving non-linear image sensor position controller magnifies the effect (for selected shutter speeds between about 1/180 s to 1/60 s) by another 100 %. Is it possible for this loop behaviour to be tighened up via a firmware upgrade? @dosdan: yes, if the control is done by the CPU as described in the patent. However, firmware symbols hint at an IC chip doing this and then it may or may not be possible without replacing this chip. Depending on the exact function of the chip. But sloppy control parameters are just ONE possibility to explain the measurements. But yes, there is a scenario where a firmware update could help. It's likelihood is another story. Falk, The magnetic actuators that hold the sensor in position seem to be pairs of coils working in opposition to each other working on a rare earth permanent magnet. These are positioned on all 4 sides of the sensor's floating plate. The balance of current and hence flux between the opposed coils gives a null point where the sensor sits once it has leapt into position from it's resting spot at the bottom of the mirror box. These null points have been made accessible to us K7 users during live view, where we can trim the sensor position, presumably by reducing current in one coil and increasing it in the other. Perhaps if the base current through both coils could be increased somewhat (without burning out the coils or using too much battery capacity) the sensor may be held firmer in position and be able to resist the shock from the shutter. This may be only possible to implement with SR off, as it may effect the range of sensor movement with SR on. I could live with SR off at 1/80s with my 15mm lens and have the sensor held more securely! @Elmar: you make an interesting proposition. In the study's language, this would amount to increasing the maximum magnetic driving force called Fmax (below Fig.22). Not a bad idea. However, the study suggests that Fmax is sufficient. Our simulation includes the "leap into position from the resting spot at the bottom of the mirror box" as you say. This happens within a rather short period of time (18ms if I remember correctly) and our simulation delivers a minimum value for Fmax where this can succeed (driving and lock the sensor position). Using this minimum value Fmax, our simulation shows that it does also suffice to withstand the shock from the shutter-induced accelerations well enough. If the controller loop is as well behaved as the one in our simulation. This is why we believe that it isn't a principle flaw of the SR mechanism but just an oversight for a yet to be identified detail. The fact that the K20D works well enough further supports our believe that the magnetic strength Fmax isn't simply too weak. But if, the idea may help; if feasible w/o physically changes to the camera. Falk, Fmax would be applicable when driven hard, but how much centreing effect is there really a few uM each side of the null? Or in other terms, how broad in uM is the null point? We also have an additional bit of circuitry tacked on with the K7 over the K20 - the automatic horizon correction. Perhaps this extra add-on has de-tuned the SR controller? I believe that Pentax have been fiddling around with this SR controller, as I noticed that with FW17 horizons were no longer as level as I saw in the viewfinder. It's almost as if the sensor rotation factory calibration was being ignored. With FW22 it seems to be back to normal. Just out of interest did you make any test shots with and without horizon correction? Was there any difference? @Elmar: well, we did a full PD controller simulation taking all this into account. There is no "null point", just weaker forces for weaker deviations. Ut to Fmax for large deviations. Ignore SR, automatic horizon correction and everything. This just influences some "goal" position which is to be considered a constant during the entire shutter event. You are mixing two different time scales here. Falk, publishing a paper which immediately includes a series of Frequently Asked Questions is illogical self referencing. By definition there can not be FAQ-s on 'day zero'. They are questions you created in your mind, not questions ASKED by the readers, and not FREQUENTLY. There were no readers yet when you released the paper (and please, do not say that many people read your paper before you published it, and you collected their questions as FAQ instead of folding the questions into the paper before the release). Nice talking to you, Derek. @Derek, not everybody shares the same sense of humour. To put a list of FAQ below an article when brand new is a "paradox" joke obviously, esp. if it includes questions which certainly have never been asked. Because at least one person did not get it, let me say that there are no further jokes. But believe me, the best scientific publications include the occasional joke. Thanks very much for your hard research, I have noticed something amiss with my K7. I previously owned a K10D which was pin sharp, and now with my K7 I have noticed blur even when shooting at 1/125 - I thought it was perhaps the fact that a higher resolution sensor needs to be held steadier and more prown to show camera shake. The dpreview forum didn't think so.....but you have answered my query, thanks. My question, do you think if I purchase a D-BG4 grip the extra mass & stability will reduce the shutter induced blur of the K7? On the other hand, I'm afraid to invest any further in this system. GrJeck comment not passing minimum required quality for a comment. Thanks so much for this report! I had this problem with two Pentax K-x and one K-7, but not with my older K20D. 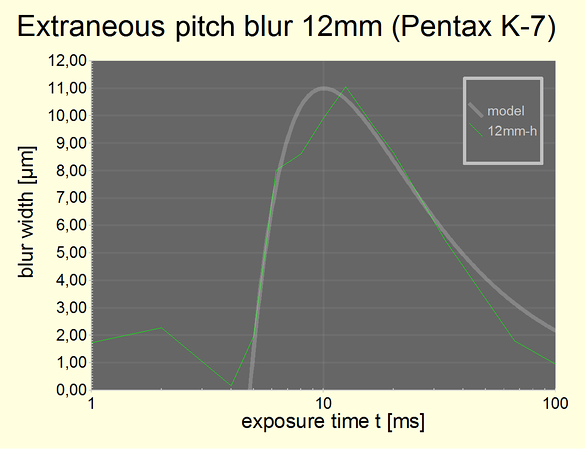 Unfortunately my history with Pentax is about to end due to this blurring issue. I don't dare buying another Pentax DSLR. I have the K-x and I have noticed this in some of the pictures, always blaming the SR. Of course, it does not bother me that much, since I had the trouble maybe with around 200 images out of 25 000. Thank You very much for this research! What the findings of this research did to me (after coming from istDS, leaving out various generations of cameras that were way better then the DS on so many levels and finally picking up that brand new K7) was constantly and panicly looking at the shutterspeed when shooting (i ususally shoot with AV mode only). It's so irrational to look out for the shutterbug in such a way but i do it because i had a very small amount of winner shots destroy by slight blurring from the old DS days. And so it's becoming a real hassle - i constantly try to avoid anything from 1/50 up to 1/125 and even then taking multiple shots because of being paranoid. Certainly i pay tribute to my controlish character but it takes the fun out of it - otherwise i would totally love this camera and don't need anything else or better for my personal photography. Thanks for your work anyway and i mean it, otherwise we would be still wondering if it's a regular user error. I for myself can't feel so 100% loyal to pentax like a couple of years ago but i guess i will stay because my investment in lenses - got myself a truly great 12-24 a couple of months ago. And i just love going fully manual K or M with my old DS. But why o why can't Pentax come up with a primitive auto iso solution avoiding this speed region in a firmware - a maniac like me just wants a convenient workaround, i don't expect a fix or something. But i think the k7 is not in focus of Firmware Development anymore. Great study !, thank's for your big contribution to resolve problems of many Pentaxians. I finally found the reason for part of my blurred pictures. @stan: About K-x, I am sorry but I didn't conduct any tests about the issue with the K-x. I may have an opinion but I hate adding noise to the internet. About blur calculation: If you follow the advice in the abstract of the paper, right before the first section "1.Motivation" starts, then you'll find all information required, incl. the software used. I could just quote the link again but using the software alone is not giving good results.